Hello lovelies! Here's another gorgeous collection for you, this one from one of my favorite indie brands- Powder Perfect. The Haunted Mansion collection consists of five deeply saturated holographic shades with different variations of glitters and microglitters. The sixth polish Hunter's Moon is October's shade from the La Lune series. All of the formulas were great and I didn't experience any issues. Let's get right to it..
Darkness & Dragons is a plum purple holographic filled with a myriad of glitters, including copper, magenta and purple. Shown is two coats plus top coat. Blackmoor Woods is a stunning forest green holographic with emerald and aqua glitters. Shown is two coats plus top coat. Rack & Ruin is a deep reddish brown holographic with metallic, copper, red, and purple microglitters. Shown is two coats plus top coat. 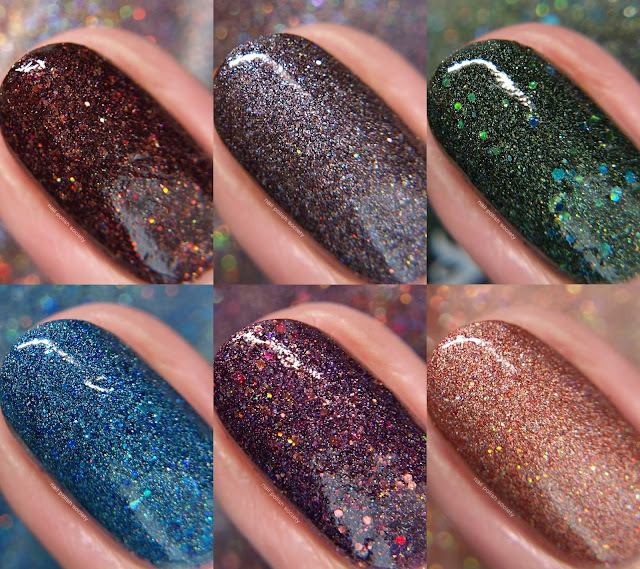 Dead of Night is a dark charcoal holographic with blue shimmer, color shifting flakies, and ultra holo microglitters. Shown is two coats plus top coat. Beast Within is a deep ocean blue holographic with aqua shards and a variety of sparkling blue & metallic glitters. The large shards do take a little bit of care in applying. Shown is two coats plus top coat. Hunter's Moon is a cinnamon gold holographic filled with ultra holo microglitters. Shown is two coats plus top coat. The Haunted Mansion collection + Hunter's Moon are available now and can be purchased from the Australian Powder Perfect website or the US Powder Perfect website.